Today the GOLD PRICE rose $4.30 (0.35%) to close Comex at $1,230.40. Silver gave up 5.9¢ to $15.368. The big move came yesterday when the GOLD PRICE gained $15 (1.2%) on Comex, then suddenly burst up another twelve bucks in the aftermarket. Never did find out what caused the buying panic. The SILVER PRICE through all this has remained comatose. Jumpy markets give clues to underlying intentions. 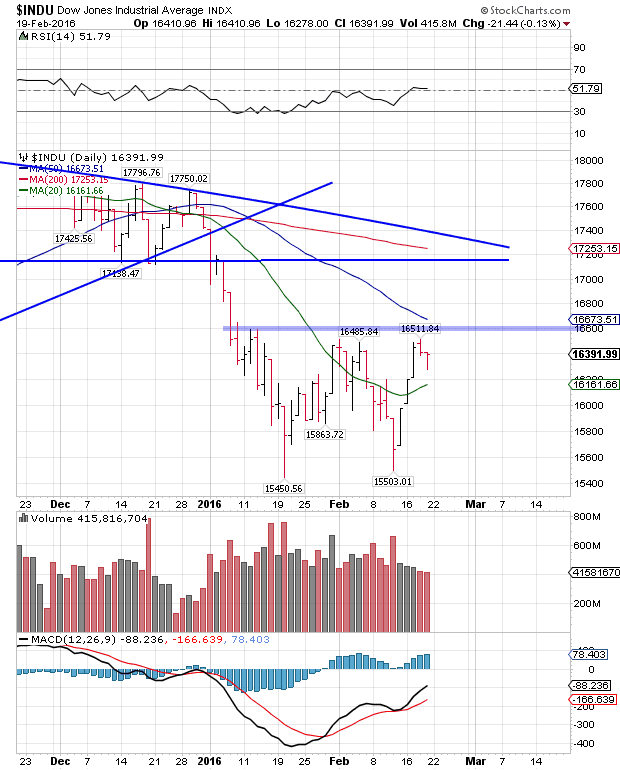 The stock market with its sudden sharp rallies that dwindle quickly typifies a bear market rally. Note that gold’s jumpy bias takes it UP, not down. Somebody bought a lot of gold quickly because he was scared he miss a move or get trapped. Market’s spooky. 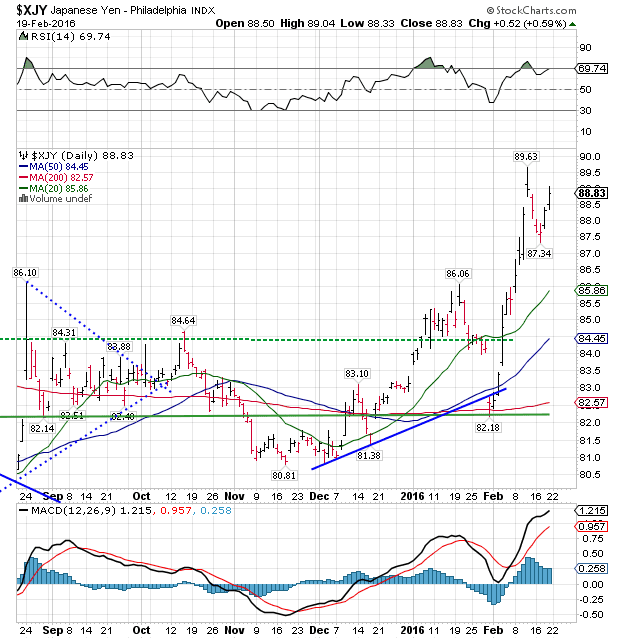 Silver’s lethargy against gold’s energy has pulled the GOLD/SILVER RATIO up to a new high for the move at 80.062. Still signalling and yelling and sending off flares for y’all to swap gold for silver. 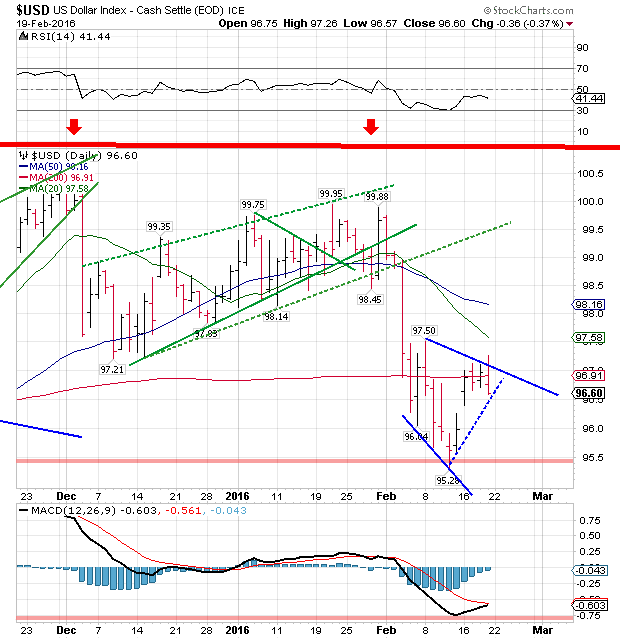 The gold price present correction probably has one more downleg over the next few days. Then it will rise again. Of course, any close above $1,263.90 (last intraday high) explodes that downleg idea. Likewise a fall below $1,190.00 would call for a serious rethinking of gold’s intentions. A chart’s worth a thousand words, so check it out on the right. 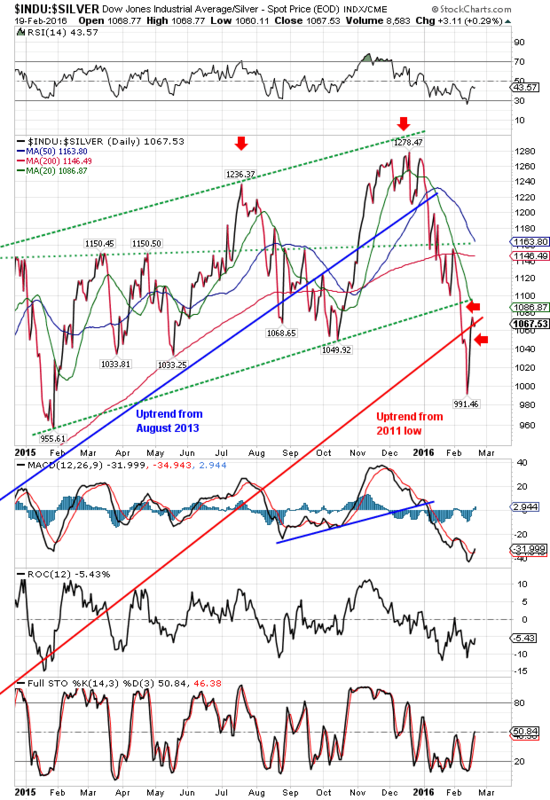 Unless the present trend is contradicted by moving below $1,190, the trend is solidly HIGHER. 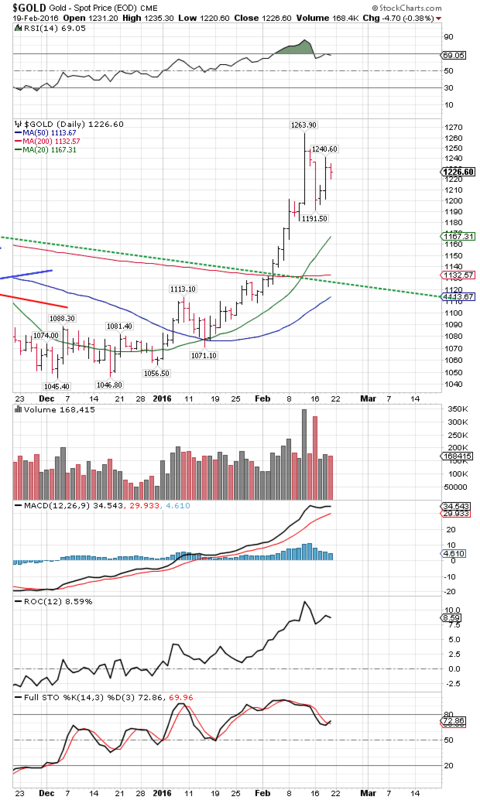 By the way, both silver and gold prices remain broken out on their weekly charts. The SILVER PRICE laggeth, but one day will play catch up with gusto. Has remained above its 200 DMA. Look at this chart. Looks to be building for another rise, after that one more downleg. 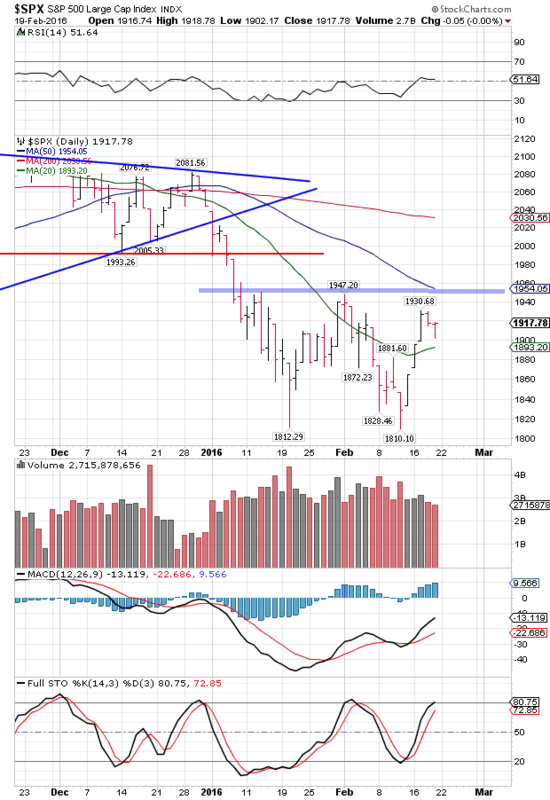 Renewed rally ought to begin next week. In vain I search the evening news, but Alas! there appear only stupidities too low and unworthy and uninteresting to lampoon. I must stick to markets instead. 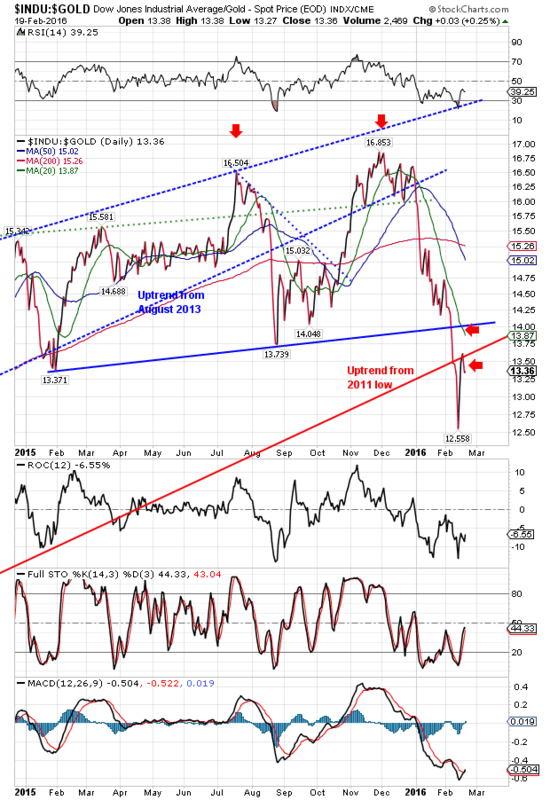 ‘Twas a week of correction: downward for silver and gold, and up for stocks. Stocks had their best week in 2016, but Dow remains 5.9% below where it began 2016, and the S&P500 6.2% lower. This is what the yankee government and Fed economists call “negative growth.” US dollar index rose but stalled, along with stocks. Euro fell all the way back to its 200 day MA ($1.1064) before it caught traction. Today it gained 0.19% to $1.1131. Trashy. The Japanese Nice Government Men have a sizeable and ugly problem: the yen won’t stop rallying. Not even negative interest rates have been able to cool it. Today rose another 0.52% to 88.77¢/Y100 (Y112.65 = US$1). Running away from ’em. Stocks, I reiterate, have lost much ground in 2016, but today all Wall Street’s pimps, and they are legion, rolled out in force lauding stocks’ superior performance this week, i.e., they rose for the week. I, on the other hand, no more’n a nat’ral born durned fool from Tennessee, fail to see the beauty in a one week rise by something that’s fallen about 6% already this year. This smells of gangrene, not health. Why’re them toes turning black? Lo, even I was surprised when stocks hit their resistance (16,600 and 1,950) and crumpled. Dow Industrials painted a key reversal yesterday and today, with a break into a new high for the move and lower close on Thursday followed by a lower close today. S&P500 did not quite match, but came close. Today the Dow lost 21.44 (0.13%) to end at 16,391.99, an event the financial media, which, I remind y’all all emanate out of New York, characterized as “flat.” S&P500 barely moved, down 0.05 point to 1,917.78. I’m not saying this is fatal, only that it seems watery-weak to fade before it even gets into resistance. I really was expecting some kind of rally, and this one in the last 5 days has accomplished only throwing a leg over the 20 DMA. Stocks are getting so poor they couldn’t afford syrup if it fell to a penny a sop. All the Dow in Gold has managed to do in the way of rallying has been to climb up to the uptrend line from the 2011 low, which it penetrated earlier. Now it’s dropped down again. Surely it can rally more than that? This implies that stocks are even weaker than I imagine. Dow in gold ended the day at 13.36 troy ounces (G$276.18 gold dollars). Dow in silver is acting similarly weak. Ended the day at 1,067.53 oz (S$1,380.24 silver dollars. Both this indicators still scream that stocks topped against silver and gold last summer and in December. Every 3 months or so I do an interview with Catherine Austin Fitts for her Solari Report. Here’s a link to a little taste of that interview when I am discussing the thinness of the physical metals markets. http://bit.ly/1LxOGRa If nothing else, you may catch a laugh. I hardly know how to thank y’all for your prayers on Susan’s behalf. Pain in her eye is somewhat less, but still tormenting her. She’s waiting for a very stubborn stitch to dissolve. I would be more obliged still if your prayers for her continue to go up. She’s tough, but the pain’s wearing on her.